Processing times are subject to extension currently as the Azerbaijani government has moved the processing of visas back to Azerbaijan rather than being handled in the UK. Please allow additional time for your application. We would recommend not booking any non-flexible travel arrangements prior to receipt of your completed visa. This page allows a Citizen of the United Kingdom to purchase a Single Entry Business Visa for Azerbaijan. A Single Entry Visa to Azerbaijan will allow entry to the country on one occasion for up to the maximum stay within the validity period. Re-entry is not allowed. If you need the ability to return to the country within the same validity period you should choose a different visa type. Valid For: 90 days The visa validity period refers to how long the visa remains active from the time that it was issued. Please ensure that you leave the country before the visa expires. A telex invitation letter from the Azerbaijani Foreign Ministry is required if you are choosing the Express or Urgent Service, or if you are applying for a Multiple Entry Azerbaijan visa. Liaison with the Azerbaijan Embassy in London for any queries and attendance where required. No more wasted time for you on the phone or in line at the Embassy. Collection, Check, Scan & Dispatch of your completed Azerbaijan Visa. Let us make sure everything is as expected for worry-free travel. Whilst Vital Consular is not affiliated with the Azerbaijani government, we have been working with the London Embassy network since 2008. You don't have to put up with unanswered calls and long queues - we do that for you. For this, our prices include a service fee to handle your Azerbaijan visa. 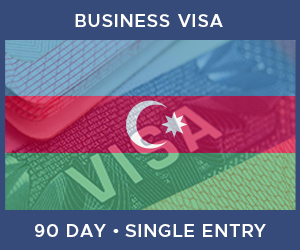 In order to apply for an Azerbaijan Business Visa you will need to supply a number of items. Click on any of the icons below to learn more about each one. Passport with 3 months validity and 2 blank pages.